The Memorial Day weekend of 1993 was as memorable as any in the life of a young couple. Yes, I do refer to Melissa and myself. We were driving to New York City to join our church choir to sing at Carnegie Hall. It would be a once-in-a-lifetime event and we were going to make the most of it. 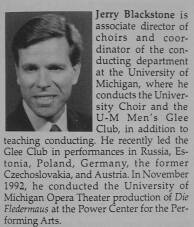 The occasion was the Carnegie Hall directorial debut of Dr. Jerry Blackstone, Associate Director of Choirs at the University of Michigan, who was a member of our church, the Huron Hills Baptist Church of Ann Arbor, Michigan. 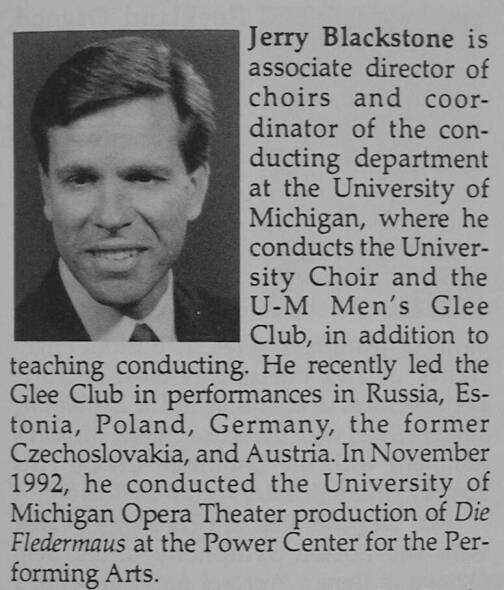 And since Jerry and his entire family, Dodie, his lovely wife and respected musician in her own right, and children, were highly respected in the church and community, it was thought that taking advantage of his relationship to the church was the only way this choir was going to stand on stage at Carnegie Hall. 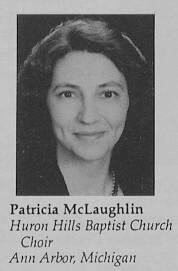 Our fearless and gifted choir director, Pat McLaughlin, felt no shame in using this association to our benefit. Indeed, isn't this how any choir makes its way to that elite stage: connections! I must add talent should also play a part however small. With a few deft phone calls (or was it millions?) 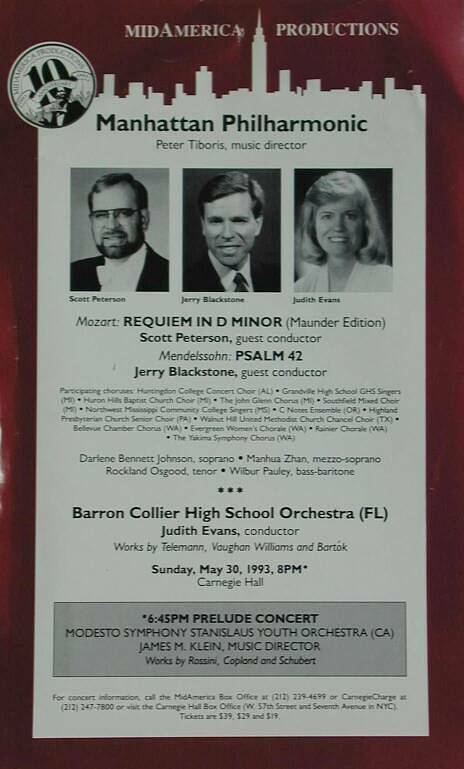 Pat secured our invitation to join 12 other "choruses" in an evening presentation of Mendelssohn's Psalm 42, a stage that would be shared on that night with John Rutter conducting one of his compositions. This would not be the only magnificent event for Melissa and I that weekend. Stay tuned as you hear of our visit to Broadway. Opting not to ride in the church rented school bus with the other members of our choir, which were to include young and old, large and small (including infants), all in all a boisterous bunch, we would certainly miss out on that special camaraderie. But Melissa and I drove by ourselves to eastern Pennsylvania the evening of Friday May 28th stopping close enough to the city to be able to reach it early Saturday morning. This would afford us some time to make a short a.m. tour and then continue on to our destination, the old Pennsylvania Hotel, now called some forgettable name, owned by some forgettable chain, driven into structural despair, situated in lower Manhattan right across the street from the Madison Square Garden. That Saturday morning erupted gloriously for a late Spring day and we decided that a visit to Ellis Island was our tour de-jour. In the slight chilly misty morning sunshine we boarded a ferry on the New Jersey shore and were safely delivered to the small island at the mouth of the Hudson River. It was a stunning visit of the facility and exhibits, reading sobering accounts of early passengers deposited on this shore in the late 1890's and early 1900's. And we each looked for family names on the wall of immigrants displayed outside the main building, Melissa finding one, and I none. We then stopped at the Statue of Liberty for an hour or so before returning to the mainland, Manhattan Island to be precise. The late morning was turning quite warm and we declined to wait in the lengthy line snaking almost imperceptibly up the 167 steps to the top of the statue towering 152 feet above Liberty Island. The experience of driving into Manhattan is another not-to-be-missed event. If I didn't have to perform that particular bit of vehicular surgery, knifing through the city's arteries, I certainly would not have missed it. But as we did drive ourselves, by necessity we had to motor into the city to the hotel. The bus riders were spared this pain. Actually, since it was the Memorial Day weekend, traffic would be relatively light. This did have an effect on the attendance for the performance however, though only just a little. We successfully negotiated our way to the hotel, making only one wrong turn (don't follow strange tour busses!). Retrieving our luggage from the trunk we trustingly turned our car over to the hotel staff who would disappear with our vehicle promising he would park it a just short distance away in an enclosed, protected parking structure. And so we entered the premises. This run-down flea-trap of a hotel was, we are fairly sure, chosen for one reason: it had huge rehearsal rooms in the top floors. The company running the event that weekend, MidAmerica Productions, had some arrangement with the hotel and used it exclusively. Our donation to the project, some $500 per attendee, furnished us with a closet-sized room facing an outside wall. The meals were our responsibility. Upon entering the room assigned, Melissa's reaction was immediate: we are getting another room! There was, in my opinion, plenty of space if you didn't mind always walking sideways. Evidently Melissa did mind and a quick call was made to the Concierge. It seemed effortless to get another room assignment, we must have arrived well before most of the others. The new room was a little larger than the first but almost imperceptibly so. However, figuring we would only be in the room for sleeping, showering, and changing clothes, we accepted the selection. There were many highlights of the weekend for us. Not the least of which was the company of some good friends in the choir, walking around town, visiting the top of the Empire State Building, a delightful "Midnight Dinner Cruise" on the Hudson River which actually started around 2 o'clock in the morning due to a late exit of high-schoolers on the cruise just before ours. But great fun entertaining each other as we waited on the bus seemed to compress the waiting time. One other highlight of the weekend was when our small choir sang in St. Patrick's Cathedral, permission arranged by Pat McLaughlin. A couple of other participating choirs joined this mini-event as well, and we enjoyed singing some of our a capella numbers in the majestic setting of that old structure. 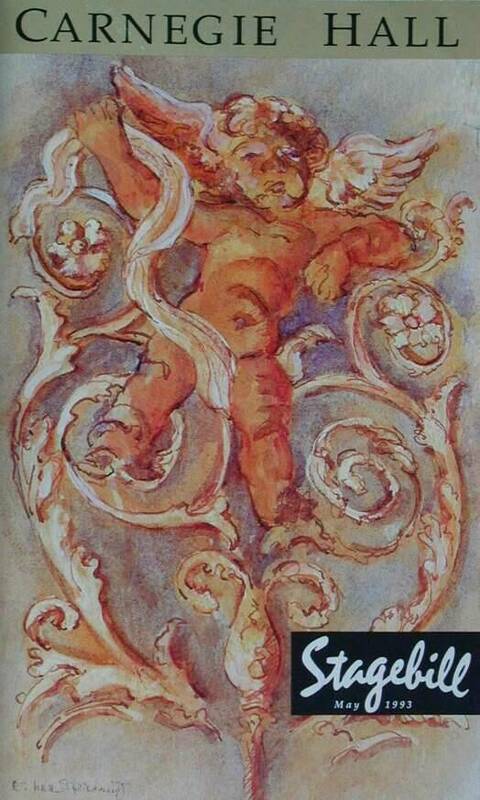 Ubi Caritas was one of the numbers we performed, one of my all-time favorite choral pieces. It can't be stressed enough how glorious such sound can be echoing through the grand stone enclosure! It gives you goose-bumps! Saturday evening, the day prior to the concert, was to culminate in dinner at Sardi's, a restaurant famous for the caricatures of famous people filling the walls and right across the street from The Majestic Theater, our ultimate destination that night. A group of 8 from our choir entertained each other over a pleasant meal prior to the play, one which most of them would attend. The food was good, the company a pleasure, and the check situation confusing. It was difficult to determine just what was on each of our separate bills, and was the tip built in. The general consensus was that the tip was indeed included. After some lengthy group discussion a wad of cash was contributed by all to Chuck Curtiss who was nominated to "settle up" for us all and we waited for him out front absorbing the early evening atmosphere unique to New York City. After some length Chuck finally appeared with a look of good natured exasperation. He explained that as he left the cashier he was approached by our waiter asking if we did not care for the meal. Not understanding the implication the gentleman explained that we had left no tip! I'm sure Chuck did his best to explain our behavior, that indeed we had a delightful time, but had determined that the tip was already itemized in the statement. He scraped together the few dollars he had remaining and gave them to the waiter, who, I am sure, felt this was still too paltry a sum to assuage his hurt pride. We reimbursed Chuck laughing at our hayseed, small town vulgarity, and proceeded across the street to the theater. The Broadway play we selected to see that night was the Phantom of the Opera. My older brother Jim, who worked frequently in the city, offered to get tickets for us well in advance. Melissa and I got 4 so that another couple could join us. Chuck Curtiss and Nancy Swauger were selected and accompanied us to our seats which were located on the main floor just a few rows from the back wall, well underneath the mezzanine level. The result was that, while we could see the stage fine from there, we could only see upwards about 20 feet off the stage floor before the view was obliterated by the floor above us. There were some action scenes that would occur higher than that off the floor which we would miss out on but it didn't detract too severely from the whole experience. Especially considering what happened after the intermission. What occurred was that after we enjoyed a rushed glass of champagne during the 10 minute break between the second and third acts we found our seats as the lights finished dimming. This time I took the aisle seat which Melissa had previously occupied. Our friends were relegated to the third and fourth seats as before. As the 3rd act began Melissa whispered a minor complaint to me about the "Big Hair" in front of her. I offered to change places with her. I could see just fine from my vantage point but made the offer willing to sacrifice my view. She declined mentioning that while it would help she had already missed much of the play up to that point it didn't matter now. This I could not tolerate since this performance was a major event on this journey. So I rose from my seat in the dark mentioning that I would be right back. Hoping to miss as little of the play as possible I rushed to the manager's office and quite politely lodged my complaint. "Big hair, eh?" he responded quizzically pondering a solution. He called in an usher standing outside his office and asked him if so-and-so was present this evening. Negative, they were out of town. The manager directed me to follow the young man. Not quite knowing what was happening I dutifully followed the usher down one dark corridor after another. Almost feeling lost in a maze we shortly walked through a curtained doorway out to a sort of landing area perhaps 20 feet from stage left. The scene was breathtaking, as the entire front of the theater was now completely opened up to me. It was like having squinted through a straw to now standing on a mountaintop, the glory of the production rushed up closely to me. The gentleman reached against the wall and unfolded two chairs and bid me good night. Hardly able to contain myself I wandered back through the hallways, able to return without mishap to my former seat. Tapping Melissa on the shoulder I whispered to her to come and follow me. I'm not certain but I don't think she knew what I was up to. But we discretely left our purchased seats and our friends that sat beside us and I led Melissa to our new location. Needless to say the remainder of the play was an incredible delight, and even the famous chandelier part would be witnessed in all its glory. We could be sad that only 1/3 or the play was seen in this manner but we prefer to look at it in a better light. At least we got to see this much so close to the players and the stage. We were so close as to even detect the make-up on their faces, not to mention the sounds being so much more distinct and resonant! It was quite glorious. Melissa sat down and I told her I'd be right back. I hurried back to the manager's office to thank him for his graciousness, and offered him a $10 tip. He politely refused indicating it was nothing out of the ordinary. I silently took issue but thanked him enthusiastically. I hoped our friends wouldn't be too upset with us for leaving them for a much nicer viewing, but I was sure they'd be gracious about it. Afterward we met up with a group of our choir members who had also selected this play to see and we all enjoyed a comfortable New York late night walk all the way back to our hotel. Even our elder friend Elmer, who had seemed relatively fragile and in questionable health, walked with his wife without complaint the entire distance, a considerable number of blocks. The ultimate experience for any musical performer can be summed up in two words: Carnegie Hall. The performance was Sunday, May 30th, and we had 2 rehearsals scheduled. This was fine since they were really more for the benefit of the conductor to solidify the numbers of choirs coming together for the first time than for learning the music. That was done in the preceding months during which so many practices were held we had virtually memorized the music. I was not previously familiar with Mendelssohn's Psalm 42, and an edition of which we would sing in German. Of course we rebelled as most volunteer choirs would at such unfamiliarity, but by the end of May it was very comfortable to us all. On Sunday afternoon we were escorted inside the musical monument for a final short rehearsal to familiarize us with placement, on stage and off. We were shown where the staging areas were from which we would wind our way through the halls and stairwells that would usher us onto the hallowed stage. This would take only an hour or so and we were on our own until early evening. Since we were all together Pat led us a few blocks away past Rockefeller Center and into Saint Patrick's cathedral where we enjoyed a mini concert in which three groups participated, of which I spoke before. We would then head back to the hotel, rest and clean up for the evening's performance. After a light meal at The New York Deli, "67 steps East of Carnegie Hall," we entered the hall for an incredible adventure. Dressed in our tux's or formal-looking attire, we waited in the appointed dressing rooms milling about and goofing off in that manner of fellowship enjoyed by those bonding in common glory. We were to go on at 8:00 p.m., so shortly before that we were lined up, from short to tall, beginning just off stage, in single file winding through the halls and up a stairwell waiting for our entrance. We would wait a long while it seemed. I was standing in line near a pay phone so I decided that I would make use of it and call my folks back home in Michigan. I dialed the number and my dad answered. I said, "Hi dad, I'm back stage at Carnegie Hall waiting to go on, what are you up to?" He enjoyed the remark for a moment and replied that he and mom had just walked in the door from their Alaska cruise. The timing couldn't have been better. Hanging up the phone after a few minutes of chat the line soon started moving, and around a hundred and one quarter singers filled the risers on stage. My place in the group was in the last row against the back wall with the highest view towards the center of the stage. Without much further delay the lights dimmed and the orchestra began. Few words could describe the all to brief time it took to perform this number, probably no more that 25 minutes in duration. But it was pure heaven to stand in the hall facing a good sized crowd and singing with unbridled though controlled enthusiasm. We did sound good, I must admit. And it seemed all the voices blended well, probably a condition of the acoustics of Carnegie. But for that brief moment we were in our glory as if singing in the presence of God Himself, the very subject of our concert. Even to this day, seven years after the fact, I can still visualize the evening, how we stood on stage, watching Jerry conduct us as if he'd stood in front of this group all his life, the sights of the huge hall before us and the sounds bathing our senses and spirits. It's too marvelous for words. The rest of the evening passed as if it was a dream. We even didn't mind the very long wait to board the large river cruiser that would carry us around the Upper Bay of New York harbor that night. As a "midnight" dinner cruise that started around two o'clock it was still a great time. Most of the choirs participated in this event that concluded our near-fantasy weekend and the boat was crowded. The night was very clear and bright with a full moon setting in the west as we dined and drank and danced the hours toward dawn to the sounds of a deafening live rock band. On the open top decks of the boat one of the better choirs spontaneously broke into I Sing America which entranced those of us who surrounded them at that moment, a view of the Statue of Liberty in the background lined up with the moon in a near cloudless ink-black sky. Some one coined the term "arm-pit moon" on account if its position as the monument passed between, a name not to be soon forgotten. It was a perfect way to end a perfect weekend. The weather cooperated with sunny skies and cool weather but for a few brief minutes as we stood atop the Empire State Building. The friendships were greatly enjoyed. The activities were momentous. Everything was exhilarating save that cramped room in which we fitfully slept, hearing the near non-stop honking of horns the entire night. But even the horns and the room would be things recalled with wonder and great amusement as part of the fabulous package on one magnificent weekend in New York City. Its equal would not soon come again.